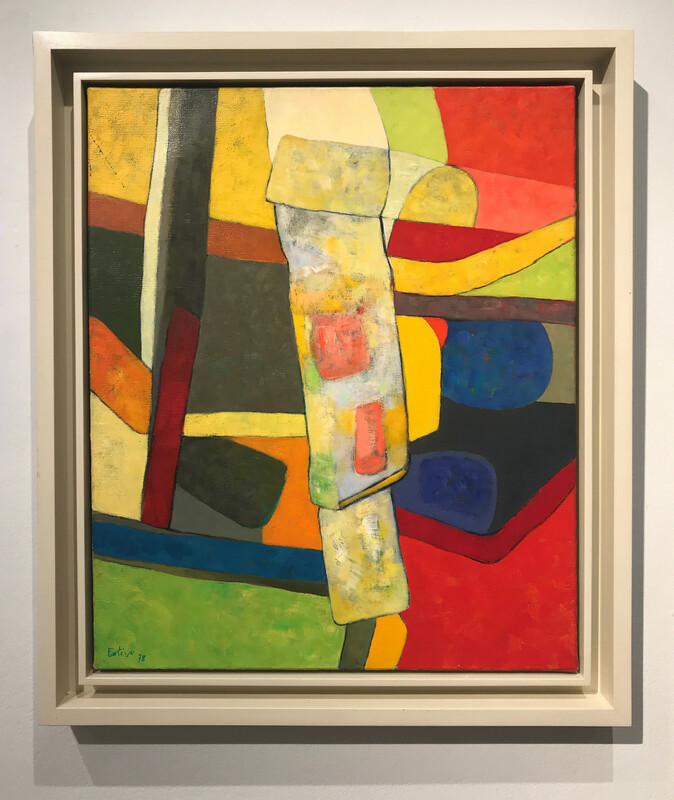 This vibrant painting is characteristic of Maurice Estève’s poetic mature style of abstraction developed after the Second World War. Born in the small rural village of Culan in the Berry region of France, Estève’s colourful and expressive style is firmly rooted in his connection to the natural world and the traditions of his pastoral childhood. In 1913, having moved to Paris to live with his militantly working class parents, Estève expressed the resonance of nature within his art after his first visit to the Louvre: “from that moment on I viewed nature through paintings”. Estève’s representation of the natural world became particularly prevalent after he was demobilised from the French army when took up his paint brush with a vengeance to capture the landscapes of his youth. Having briefly flirted with Surrealism and figurative painting during the 1920s, Estève firmly established his reputation as an abstract artist during this post-war period. 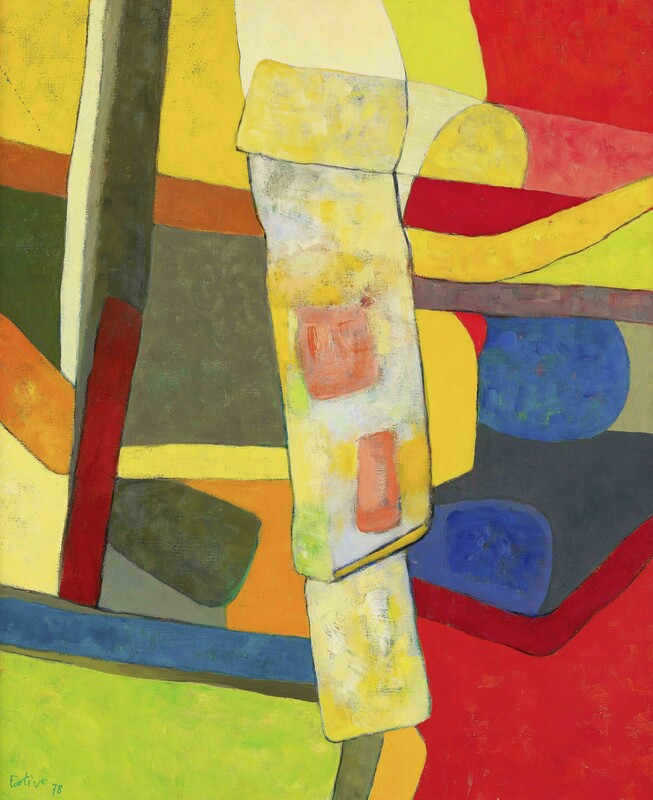 Into the 1950s, Estève was at the forefront of the avant-garde abstraction movement in France. Inspired by his particular tenderness towards the natural landscape, he explained, “I feel the nature I am part of more intensely in the forms that I invent than in the world I live in”. ‘Farfu Charpentier’ captures the fascinating relationship within Estève’s work between the spontaneous interlocking forms and vibrant palette inspired by his existential view of reality. Estève’s mosaic of colours was greatly influenced by the theories of simultaneous contrast within the work of Sonia and Robert Delaunay, for whom he worked an assistant on the monumental murals for the Railways and Aviation pavilions at the Paris International Exhibitions (1937). Renowned for his slow, methodical process working with several canvases at one time; for Estève each mark possessed an expressive meaning which altered the entire fabric of the image. Driven by an instinct where to the place each decisive mark on the canvas, Estève explained “when I’m working I never feel at ease and happy as I don’t know where I am or where I’m going”. In ‘Farfu Charpentier’ Estève allows his methodical arrangement of abstract forms to seem effortless and poetic, as if the result of a biological process. During the 1980s Maurice Estève achieved significant international success following his major retrospective at the Grand Palais, Paris (1986) and tribute to his work at the Salon d’Automne (1984) before the establishment of the permanent Musée Estève at the Hotel des Echevins in Bourges (1985). Estève’s work can now be found in collections around the world including Musée National d’Art Moderne, Paris; Centre Georges Pompidou, Paris; Tate, London and Statens Museum for Kunst, Copenahgen.